ATYAAF has only had 1 slow time over this c/d and looks better over a shorter trip so one I would look to lay at 3/1 favourite. INDIAN AFFAIR my top rated using recent times, a front runner drawn in stall 9 but could be hard to catch if getting to the front. DARING GUEST hasn't any form on this surface at this distance and it could be a better horse over a longer trip but could go well if the leaders go off too fast and fade. 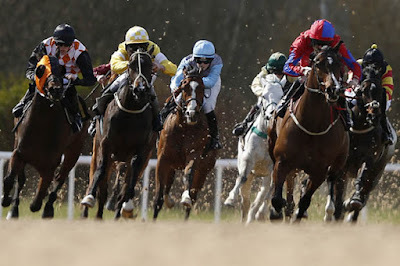 MERCURY has a time at Chelmsford which would make it top rated but that's a different surface not raced over this surface and distance before but is versatile with its racing tactics. FILBERT STREET only ran 5 times, overall poorly, and its 2 best performances were over 5 furlongs, it's not for me but if backed it could go well. KING OF ROOKS hasnt won since 2015 and its 0-8 on the aw tracks and no reason why it should improve here. KRAZY PAVING has a relatively slow time over c/d and looks to prefer other surfaces to this one so one i would look to lay at 5/1. THORNTOUN LADY another with a relatively slow c/d time but its Newcastle time is 6lb better but would still need to improve to win here. VIKING WAY is a 14 run maiden despite liking to lead, with no recorded time here and its Newcastle best is the lowest figure allowed so not for me. WILD FLOWER hasnt any recent c/d form but it did retrun a speed figure in 2017 that would make it my top rated so has to be considered and it could attempt to lead here. DODGY BOB another possible pacesetter, 5 in total, but its 0-16 aw record puts me off but could make the frame. COMPTON ABBEY has only shown slow times over this c/d mainly due to it being better over 5 furlongs and this race wont be run to suit. PICKS PINTA is well weighted on its best time from 2018 and ran within 2lb of that figure at Newcastle this year, usually stays on strongly at this distance. SUMMARY: On my figures theres four horses that could contest this race, Dodgy Bob 8/1 from stall 3 could lead and gain control of the rail, Indian Affair 9/1 would be my confidant selection if it wasnt drawn in stall 9 with 3 other fast starters on its inside but if it does get to the front could prove hard to catch, Picks Pinta 12/1 will be staying on strongly and this is its favoured surface, if Wild Flower 16/1 can reproduce its 2017 time then this one would be my sole selection, so dutching them seems the most logical answer to this race.